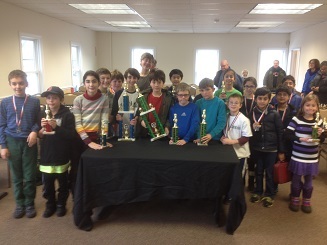 The bad weather over the weekend did not prevent players from making it to the December edition of our K-8 Scholastic Championships. Joseph Ho won the K-2 section with a perfect 4-0 score! 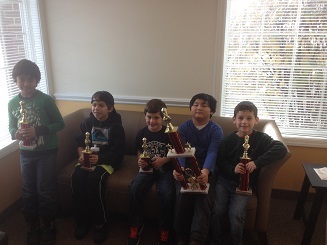 Second place went to Jack Cole, third to Ved Bathula, fourth to Jack Weinstein and fifth to Max Feldman. The K-5 section was the largest and most competitive of the sections. Dream Teamer Mikey Lau led with a perfect score going into the final round but he was defeated by Andrew Gray who leapfrogged him into first place! Second place went to Benjamin Persily, third to Samuel Forfang, fourth to Mikey Lau and fifth went to Isabella Hall. 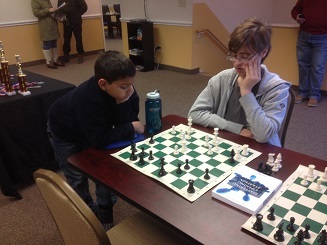 Matthew Hochberg was simply unbeatable in the K-8 section, winning of all of his games in route to first place! Dylan Young and Cole Markham tied for second and Anna Argulian and Annika Magaro tied for 4th – 5th.